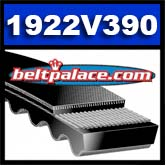 Home > Variable and Multi-Speed Belts > MULTI-SPEED BELTS > 1922V417 VARIABLE SPEED BELT (Bando Power Max) > 1922V390 Multi-Speed Belt, Industrial Grade. VARIABLE SPEED Bando Power Max. GATES, BANDO, BROWNING, JASON, SPEED CONTROL 1922V390 Belt. Approximate replacement for Comet 300262 belt.